The Rebel Sweetheart. : Foodie Goodie | Omurice! Earlier this week, I received a recipe request from one of my readers, who turns out to be a fellow KPop fan. I'm more than happy to do this post for her, as the dish she's asking for plays a huge role in Rooftop Prince - one of my favorite Kdramas from last year. And if you've seen this drama too, then I guess you know what dish I'm talking about. Yep, it's Omurice! A fusion cuisine of Japanese origin, 'omurice' is basically a duo of omelette (omu) and fried rice. This dish was first seen at a western-style restaurant in the Ginza district of Tokyo sometime during the 19th century. Introduced in Korea during the Japanese invasion, omurice remains a popular, well-loved dish in the Land of the Morning Calm until this very day. Lee Gak (played by Park Yoochun) and his subjects enjoying Park Ha's (Han Ji Min) omurice. 1. Dice chicken, bell pepper, carrots, and onion. 2. Heat vegetable oil in a frying pan and sauté diced chicken. 3. Add diced onion, carrots, and green pepper and the cooked green peas in the frying pan. Sauté together. 4. Add cooked/steamed rice in the pan and mix well. Add a dash of salt and pepper. 5. Turn off the heat, add ketchup and mix well. 6. Heat another frying pan and put some vegetable oil. 7. Whisk an egg in a bowl and pour the egg in the frying pan. Quickly spread the egg in the frying pan and make a thin, large, and round omelet. 8. Place chicken rice in the middle of the omelet and fold top and bottom sides of omelet over the chicken rice. 9. Cover the frying pan with a plate and turn them over to place the omurice in the plate. 10. 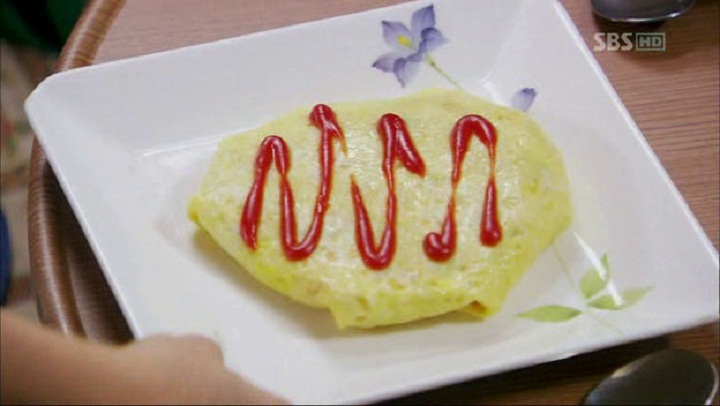 Put some ketchup on top of omurice and serve hot. And there you have it, Omurice inspired by the Rooftop Prince. 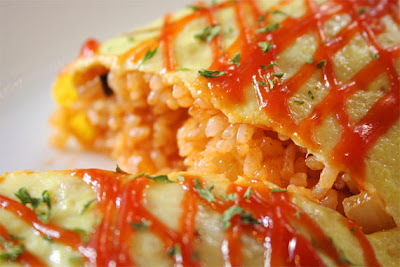 Lately, I am hooked to Korean cuisine :) And Omurice is actually one of my fave apart from the banchan! WOW! This sounds interesting, and exciting to try :D Omelette and rice! hello kpoper! will try this hahahha. ang hirap kase minsan gayahin ng recipe ng korean, ang mamahal kase sa grocery ng ingredients. Great outfits and yummy food! I've never eaten anything like that before... it looks like a tortilla :). I'll try that, it looks delicious. Oh, so that's Omurice pala! Great idea, I think I can try this at home too! I was able to try omurice in UCC and I liked the taste and the variety it brings.